Oil prices are rising to their highest level in months, with WTI having topped $60 per barrel, but the U.S. shale industry is still showing signs of strain. The oil majors are scaling up their operations in the Permian basin, with ambitious plans to ratchet up output. ExxonMobil plans on hitting 1 million barrels per day (mb/d) by 2024 from the Permian, and Chevron hopes to reach 900,000 bpd. U.S. shale is more important than ever to their business plans. But even as the role of shale is critical to the majors, small- and medium-sized E&Ps are struggling. Poor financial returns, loss of interest from investors, pressure to cut spending and return cash to shareholders, and encroachment from the majors are tightening the screws on smaller drillers. The “shrinkage in market capitalization of some companies is breathtaking. These loses translate into a loss of interest in further direct investments in the drilling of new oil and/or natural gas prospects,” another respondent said in the Dallas Fed survey. Some of the most secretive, highly-anticipated details about the Saudi oil industry have just been released. Saudi Aramco is preparing to launch a major bond issuance to purchase the Saudi petrochemical company Sabic, a process that required a detailed prospectus on the company. As part of that review, Aramco released on Monday some closely-guarded state secrets that have been kept under wraps for decades and have been the subject of endless and wild speculation. With little fanfare, Aramco released some details …and they are somewhat damning. For instance, the Ghawar oil field, which has at times held an almost mythical status both because of its massive size and also because of the complete opaqueness on its inner workings, can’t produce as much as previously thought. Ghawar is the core of Aramco’s oil production, and is of vital national security importance to the Saudi state. The prospectus says that the Ghawar field can only produce 3.8 million barrels per day (mb/d), not the widely thought 5 mb/d that has floated around for years as a rough estimate. “As Saudi’s largest field, a surprisingly low production capacity figure from Ghawar is the stand-out of the report,” said Virendra Chauhan, head of upstream at consultant Energy Aspects Ltd., according to Bloomberg. There was little other detail offered on that figure, why it declined, or whether it would continue to decline. But it is a very significant downward revision. Nevertheless, the Aramco prospectus confirmed some more impressive figures that have also been the subject of speculation. The document says the company can produce 12 mb/d, a rate of output that has been criticized and questioned. With current production at about 10 mb/d, that implies a current 2 mb/d of spare capacity, which is a comfortable buffer that could plug some hypothetical supply gaps. In addition, there is about 500,000 bpd lying dormant in the Neutral Zone on the border with Kuwait. The collapse of oil prices late last year, along with pressure from shareholders, has led to a slowdown in the U.S. shale industry. The EIA released new monthly data on March 29, which revealed a decline in output of about 90,000 bpd between December and January, evidence that shale drillers slammed on the breaks after oil prices fell off a cliff in the fourth quarter. The 90,000-bpd decline came after a rather meager 35,000-bpd increase the month before, which was the weakest increase in months. But the U.S. shale industry is facing more headwinds than just a temporary dip in oil prices. Shareholders have run out of patience with unprofitable drilling, and are demanding returns, which is tightening the screws on less competitive companies and forcing spending cutbacks across the board. More worrying for the industry is a growing recognition of the “parent-child” well problem – the unexpected poor performance of subsequent wells drilled in close proximity to the original “parent” well. These obstacles are beginning to pile up. Schlumberger and Halliburton, the two top oilfield services companies, have predicted that shale drillers will be forced to collectively cut spending by more than 10 percent this year. The slowdown could put some bullish pressure on the oil market, already suffering from outages in Venezuela, Iran and coordinated cuts from OPEC+. While U.S. inventories rose unexpectedly last week, much of the increase can be chalked up to turmoil in the Houston Ship Channel following a major fire at a petrochemical facility. Indeed, some analysts see significant stock declines in the next few weeks. “The most visible inventory levels in the world…will fall victim to a potent mix of Venezuelan supply disruptions, a Houston Ship Channel chemical spill, and an uptick in refining runs,” Barclays wrote in a note on March 29. The investment bank sees WTI rising to an average of $65 per barrel this year. The oil industry is starting to feel the pressure of climate change. Oil executives, by and large, have not been swayed to change their business practices despite years of warnings about the climate crisis. However, they are beginning to listen to shareholders who are demanding change, while also seeing policy risks looming just over the horizon. The annual IHS CERAWeek Conference in Houston is usually a gathering of oil titans who meet to celebrate their business. A backslapping affair, the event doesn’t spend too much time worrying about climate change. This year is a bit different. There has been palpable anxiety about the future. Shareholders are putting pressure on companies to report their risks and exposures to climate change. At the same time, oil executives are worried that shifting technologies, pushed along by government policy, will threaten future oil sales. Last week, Norway’s $1 trillion sovereign wealth fund proposed a divestment from oil exploration companies, an event that may turn out to be a significant moment in history, marking the beginning of a difficult chapter for the oil industry. A collapse of production in Venezuela, aggressive production curtailments from OPEC+, relatively strong demand and an economy humming along – and oil prices are still sharply below the highs seen last year. To be sure, oil has bounced just about to the highest level since November, and a confluence of bullish forces seem to be pushing prices in an upward direction. But in years past, news that an oil producer like Venezuela suddenly saw production fall from over 1 million barrels per day (mb/d) down to 500,000 or 600,000 bpd overnight would have sent prices skyward. Now crude jumps by a buck or so. The reason for the relative restraint is that the market has been anticipating U.S. shale production to grow at an unchecked rate. In January, the EIA predicted the U.S. would average 12.1 mb/d of oil production this year. A month later, the agency revised that forecast up by a massive 300,000 bpd to 12.4 mb/d. It was a familiar narrative. U.S. shale continues to exceed prior expectations. However, the EIA just downgraded its forecast for the first time in six months. The latest Short-Term Energy Outlook sees output averaging 12.3 mb/d. It’s a rather minor downward revision, but the direction is important. U.S. shale drillers are facing a serious problem: Their wells are not producing as much oil and gas as they had anticipated. When facing shareholder scrutiny, shale drillers have countlessly hyped the litany of technological breakthroughs, efficiency gains and innovative drilling techniques. Indeed, production from U.S. E&Ps has skyrocketed over the past decade, save for interruption during the 2014-2016 bust. But even then, shale executives argued that the downturn made them lean and mean, and that they would use their newfound frugality to ramp up production and profits. But the hype has slammed into reality on a few fronts. First, after years of bankrolling the shale industry in hopes of juicy profits, Wall Street is starting to lose patience. Some companies turn a profit, but the industry on the whole has been losing money since its inception in the mid-2000s. Executives are once again promising that enormous profits are just around the corner, but you could forgive the skeptics for questioning whether that will turn out to be the case. Suddenly, there is evidence that the industry is running into a wall. The Wall Street Journal reported that shale wells placed too close together are starting to report unexpectedly disappointing results. The thinking is that the wells are interfering with each other. Drilling activity has plateaued in much of the U.S., with the rig count zig-zagging well below the peak from last November. The rig count often rises and falls in response to oil prices, but on a several-month lag. It takes some time before oil companies make drilling decisions in response to major price movements. As such, the price meltdown in the fourth quarter of 2018 is still working its way through the system. But the U.S. shale industry has already begun to tap the brakes. Total U.S. oil rigs are stood at 853 for the week ending on February 22, down from a peak of 888 in November. In particular, the Permian – often held up as the most profitable and prolific shale basin – has seen the rig count decline to a nine-month low. Production continues to rise, to be sure, but the growth rate could soon flatten out. “We estimate that the y/y change in US oil drilling will, for the first time since 2016, turn negative by late May, should the current trend of gentle declines continue,” Standard Chartered analysts led by Paul Horsnell wrote in a note. At the same time, oil prices are rising again, and are up roughly 25 percent since the start of the year. If WTI tops $60, many shale drillers could find themselves feeling confident all over again, and could pour money and rigs back into the field. That said, multiple drillers have laid out more conservative and restrained drilling programs, facing pressure from shareholders not to overspend. According to Bloomberg and RS Energy Group, U.S. E&Ps have trimmed their spending plans by 4 percent on average, while at the same time they still expect production to grow by 7 percent. To Wall Street, the shale industry has lost a lot of its allure. A decade’s worth of promises have failed to materialize, and Big Finance is cutting some of its ties with smaller shale drillers who have not delivered. The Wall Street Journal reports that the shale industry only saw $22 billion in new bond and equity deals, down by more than half from 2016 levels, which was a much worse time for the market. The steep decline in new debt and equity issuance is a sign that major investors are no longer rushing to finance unprofitable shale drilling. It’s worth noting that this is a new development. For years Wall Street financed unprofitable drilling, holding out on the promise that rapid production growth would eventually pay off. Shale wells suffer from precipitous decline rates, with as much as three quarters of a well’s total lifetime production coming out in the first year or two. After an initial burst of output, shale wells enter a steep decline. Of course, this has been known since the beginning and Wall Street has long been fully aware. But major investors hoped that shale companies would scale up, achieve efficiencies and lower breakeven prices to the point that they could turn a profit. However, that has not been the case. While there are some drillers that are profitable, taken as a whole the industry has been cash flow negative essentially since its beginning in the mid-2000s. For instance, the IEA estimates that the shale industry posted cumulative negative free cash flow of over $200 billion between 2010 and 2014. U.S. shale production growth could slow by as much as half this year, according to one industry titan. Continental Resources’ Harold Hamm said that shale growth could decline by as much as 50 percent this year compared to 2018, although he added that it was just a “wild guess.” Hamm said that a lot of shale E&Ps are trying to keep spending within cash flow. This newfound mantra of capital discipline has been imposed on the shale industry after a decade or so of a debt-fueled drilling frenzy. The signs of a shale slowdown have been mounting. The rig count fell sharply in recent weeks. Production growth has already begun to slow. Schlumberger, the world’s largest oilfield services company, has warned that it is already seeing shale companies pulling back on drilling activity. In the latest Drilling Productivity Report, the EIA forecasts that U.S. shale production will grow by 62,000 bpd in February compared to a month earlier. That is the slowest rate of growth in nearly a year, and down from the prior monthly production increases that have consistently exceeded 100,000 bpd. Argus, using Barclays data, points out that North American onshore might only tick up by about 9 percent this year, down from the 18 percent jump in 2018. That could quickly translate into slower output growth. “Production is a direct response of capex today with this industry,” Hamm said at the Argus summit. The recent slide in oil prices may finally start impacting U.S. oil production forecasts. The plunge in oil prices in November and December spread gloom around the industry. Comments from anonymous oil executives in a survey from the Federal Reserve Bank of Dallas from earlier this month clearly depicted the creeping pessimism from oil country. “I expect the dramatic, unexpected and significant drop in oil prices will significantly decrease revenue for the first half of 2019. I intend to mitigate this by stopping all drilling and deferring any new projects,” one oil executive told the Dallas Fed. Another worried about lack of financing for drilling. “It feels like the capital markets (equity and debt) are backing up fairly hard, which will have a noted impact on capital spending if sustained. Coupled with the fall in oil prices in the past six weeks, this could cause 2019 plans to get pared back,” the executive said. But the downturn in oil prices, and even the gloomier outlook from oil executives themselves, hadn’t really fed through to oil production forecasts. The projections for U.S. shale still included heady growth figures, despite the plunge in prices. Rystad says slower production growth might put a lot less urgency on the closely watched midstream bottlenecks. “This raises the question as to which (if any) of the pipelines projects in the Permian slated for development will move forward if there is less oil to fill them,” Rystad stated. The oil supply surplus is “starting to reverse,” according to a new report from Bank of America Merrill Lynch. The investment bank noted that oil prices had collapsed in late 2018 not only because of an oversupply problem, but also because of other “non-fundamental factors,” including the selloff of long positions by hedge funds and other market managers, as well as by fear and uncertainty in broader financial markets. Still, the bottom line was that the oil market saw a glut once again emerge in the fourth quarter. However, “now the 1.3mn b/d surplus in 4Q18 is starting to reverse,” Bank of America Merrill Lynch analysts wrote in a January 10 note. In fact, the bank says that the OPEC+ cuts could translate into a “slight deficit” for 2019. “With investor positioning reflecting a bearish set-up, Brent prices have already bounced back above $60/bbl, and we retain our $70/bbl average forecast for 2019,” BofAML wrote. Oil price forecasts vary quite a bit, but a dozen or so investment banks largely agree that the selloff in late December, which pushed Brent down to $50 per barrel, had gone too far. BofAML is betting that Brent rises back to $70 per barrel. However, the investment bank issued a rather significant caveat. This assessment is based on the assumption that the global economy does not take a turn for the worse. BofAML analysts said that Brent could plunge as low as $35 per barrel if global GDP growth slows from 3.5 percent to 2 percent. At this point, it is anybody’s guess if the global economy slows by that much, but there is a growing number of indicators that at least suggests such a deceleration is possible. The recent data from China showing a shocking slowdown in both imports and exports is discouraging. Late last year, Royal Dutch Shell gave the greenlight to a massive LNG export terminal on Canada’s Pacific Coast, one of the largest investments in LNG in years. But like other fossil fuel projects in Canada, the plans have run into some trouble. Shell’s LNG Canada project hinges on a crucial pipeline that will connect gas fields along the border of British Columbia and Alberta to the Pacific coast at Kitimat. The Coastal GasLink pipeline is to be constructed by TransCanada (or, rather TC Energy, as the company now wants to be known). The Coastal GasLink pipeline was supposed to mark a departure from previous long distance pipelines in Canada – a project that would, from the start, adequately consult with First Nations. Prior pipeline projects – Enbridge’s Northern Gateway and Line 3; TransCanada’s Energy East; as well as Kinder Morgan’s Trans Mountain Expansion – ran into stiff resistance from various First Nations. TransCanada hoped that Coastal GasLink would be different. But, it too is now meeting resistance. Members of the Wet’suwet’en nation threw up makeshift barricades to stop construction on their land in recent weeks. On January 7, the Royal Canadian Mounted Police broke through those barricades and arrested at least 14 people. RCMP said it was enforcing a court order, but the clash made national and international headlines. The situation is complex because the Wet’suwet’en nation never signed a treaty with Canada, so their territory is neither ceded nor even formally acknowledged by Canada. “What I see is a long history of the Canadian government doing its best to avoid acknowledging the existence of other systems of government,” Gordon Christie, a scholar of indigenous law at the University of British Columbia, told The Guardian. There is a growing pile of evidence pointing to a slowdown in the U.S. shale industry, as low prices take their toll. The rate of hydraulic fracturing began to decline in the last four months of 2018, a sign that U.S. shale activity began to slow even before the plunge in oil prices. According to Rystad Energy, the average number of fracking jobs declined to 44 per day in November 2018, down from an average of between 48 and 50 for the five-month period between April and August 2018. “After reaching a peak in May/June, fracking activity in the Permian Basin has gradually decelerated throughout the second half of 2018,” Rystad Energy senior analyst Lai Lou said in a statement. “Looking at preliminary data for November, we see evidence that seasonal activity deceleration has likely started in all major plays except Eagle Ford,” Lou added. “There has been a considerable slowdown in Bakken and Niobrara in November, our analysis shows.” Rystad said that much of the slowdown can be attributed to smaller companies. The drilling data echoes that of the Dallas Fed, which reported last week that drilling activity began to slow in the Permian in the fourth quarter. Whether measuring by production, employment, business activity, equipment usage rates – a wide variety of data from the shale industry points to an unfolding slowdown. Moreover, independent data also suggests that a lot of shale drillers are not profitable with oil prices below $50 per barrel. Breakeven prices on the very best wells can run in the $30s or $40s per barrel, but industry-wide all-in costs translate into much higher breakeven thresholds. 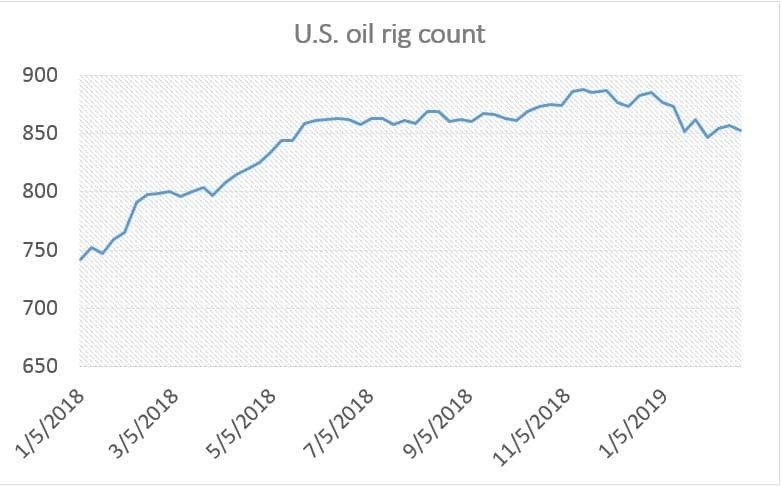 The rig count has also already plateaued after growing sharply in the first half of 2018. U.S. shale executives often boast of low breakeven prices, reassuring investors of their ability to operate at a high level even when oil prices fall. But new data suggests that the industry slowed dramatically in the fourth quarter of 2018 in response to the plunge in oil prices. A survey from the Federal Reserve Bank of Dallas finds that shale activity slammed on the brakes in the fourth quarter. “The business activity index—the survey’s broadest measure of conditions facing Eleventh District energy firms—remained positive, but barely so, plunging from 43.3 in the third quarter to 2.3 in the fourth,” the Dallas Fed reported on January 3. The 2.3 reading is only slightly positive – zero would mean that business activity from Texas energy firms was flat compared to the prior quarter. A negative reading would mean a contraction in activity. The deceleration was true for multiple segments within oil and gas. For instance, the oil production index fell from 34.8 in the third quarter to 29.1 in the fourth. The natural gas production index to 24.8 in the fourth quarter, down from 35.5 in the prior quarter. But even as production held up, drilling activity indicated a sharper slowdown was underway. The index for utilization of equipment by oilfield services firms dropped sharply in the fourth quarter, down from 43 points in the third quarter to just 1.6 in the fourth – falling to the point where there was almost no growth at all quarter-on-quarter. Meanwhile, employment has also taken a hit. The employment index fell from 31.7 to 17.5, suggesting a “moderating in both employment and work hours growth in the fourth quarter,” the Dallas Fed wrote. Labor conditions in oilfield services were particularly hit hard.